Metal and modern-rock players should make a beeline for the 6505 with its huge overdrive capability and lightning pick response. Great sound for modern rock and metal, tons of distortion and feedback at conversation level. Not as much dynamic punch from this smaller power stage means things can get a little indistinct. The 6505 Mini Head is based on Peavey's flagship 6505 design, with the same gain structure and similar front panel features. These include separate rhythm and lead preamp and master volume controls, low, mid and high EQ, a bright switch on the rhythm channel, power stage presence and resonance, together with a footswitchable crunch mode for the rhythm channel. Rear-panel features are identical to the other two mini heads, with the same speaker, DI, loop and footswitch functions. Despite having significantly different sounds, all three heads have a similar 'family' look, as the cabinets are all the same size and share Peavey's typically high build and finish quality. The 6505 is even more focused, aimed squarely at modern rock and metal players. 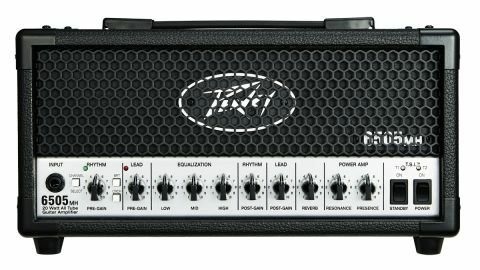 It's a bang-up-to-date version of the amp formerly known as the 5150, a popular choice for rock and metal users all over the world, and not just because of theVan Halen association. This amp's bone- crushing thick distortion is the product of a lot of preamp gain stages and a powerful resonance control that boosts the low-end response. While it has less than half the preamp valves of its full-sized big bro, it still sounds remarkably similar, with the same full bass response and OTT crunch sounds that eclipse most players' notions of a good metal lead sound. The 6505's lead channel squeezes out even more grind and sustain for a superlative rock and metal sound, although like the original, it takes some dialling in to achieve the best results.